This shrub or small tree has leaves which tend to be clustered towards the end of the branches, near the base of the trunk the rhytidome is orange. Leaves alternate, margins entire or very shallowly toothed, glabrous to 12.5 cm long. 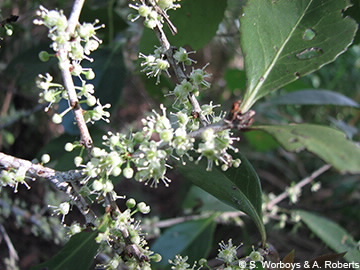 Flowers borne in fascicles along the branches, white, stamens inserted on margin of a broad disc which tends to immerse the ovary. Fruit a capsule, yellow to red, 2 valved, aril extends up the seed.